Shot on 16mm film on location with a specially composed soundtrack, this dance film was created specifically for the camera. 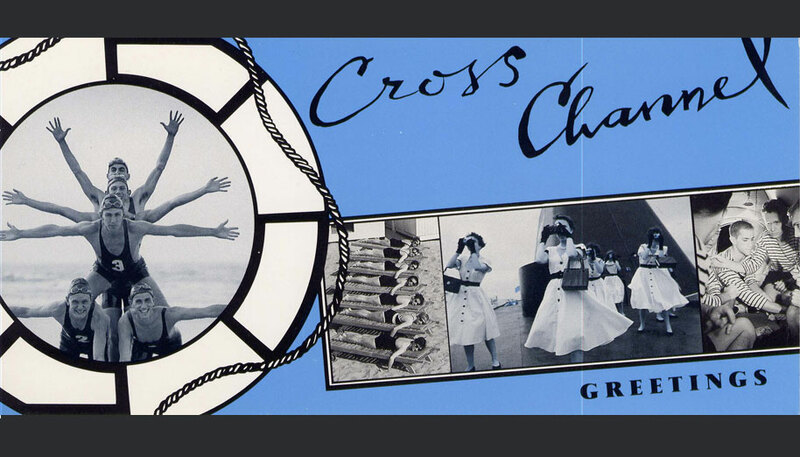 CROSS CHANNEL is a wild mix of dance and travelogue that combines some extraordinarily creative dance with comedy sequences reminiscent of silent cinema. It is about Britain and France, men and women, holiday time and sexuality. Seven women (The Cholmondeleys) and six men (The Featherstonehaughs) set off on holiday. The Cholmondeleys, en route from London to Calais, successively cram into the train compartment, take snapshots on board the ferry, get their suitcases muddled up on Calais dock, and spiral up the hotel staircase to their rooms. Meanwhile the Featherstonehaughs, on a cycling tour near Dover, cycle on their backs, crawl out of tents perched above Dover cliffs, abseil down, and tiptoe into the water. Gradually their dances converge. As the sun sets the Featherstonehaughs are transported to a beach hut to join the Cholmondeleys for an all-night bottle party. As the tide comes in, dawn reveals one upended beach hut, with a solitary figure stranded in it. ‘One of the best television dance programmes I have ever seen. Everything works, from the music to the brilliant ice-cream colour, and above all, the way in which television is exploited to expand the potential of dance’.